Guatemala offers a wonderful diversity of things to see, from the aqua green lagoons of Semuc champey, to candlelight caving and the semana santa celebrations in Antigua, we were incredibly impressed with what Guatemala has to offer! 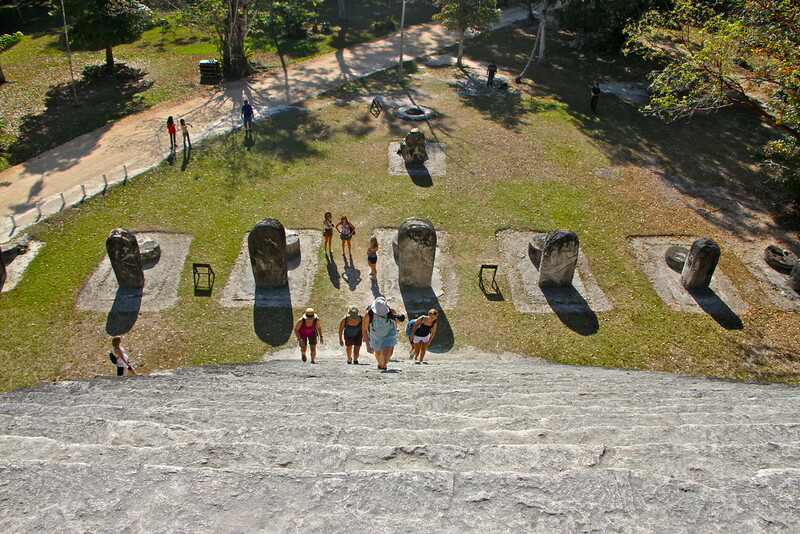 Guatemala also provided us with our first glimpse of Mayan history after our extensive travels through Incan territory! 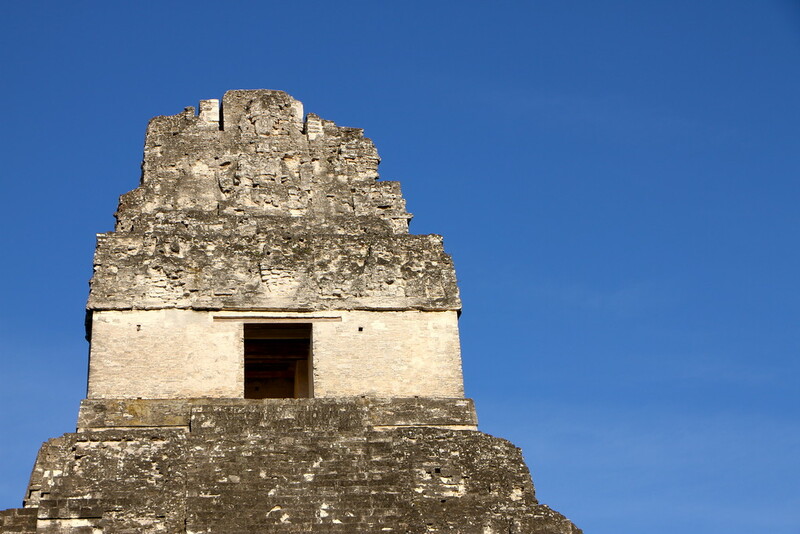 You may have heard of Chichen Itza in neighbouring Mexico, and we had considered visiting the famous site but we were put off by the number of people likely to be there, especially the large tour groups. You see, we’ve been spoilt on our travels. 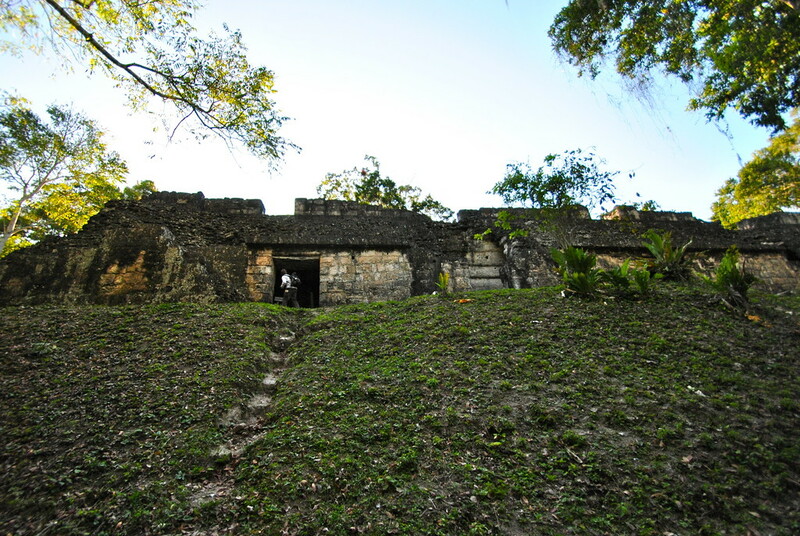 We’ve grown accustomed to visiting quieter places off the beaten track, so we decided to visit a less well known Mayan site, but arguably just as impressive near the small town of Flores in the North of Guatemala. 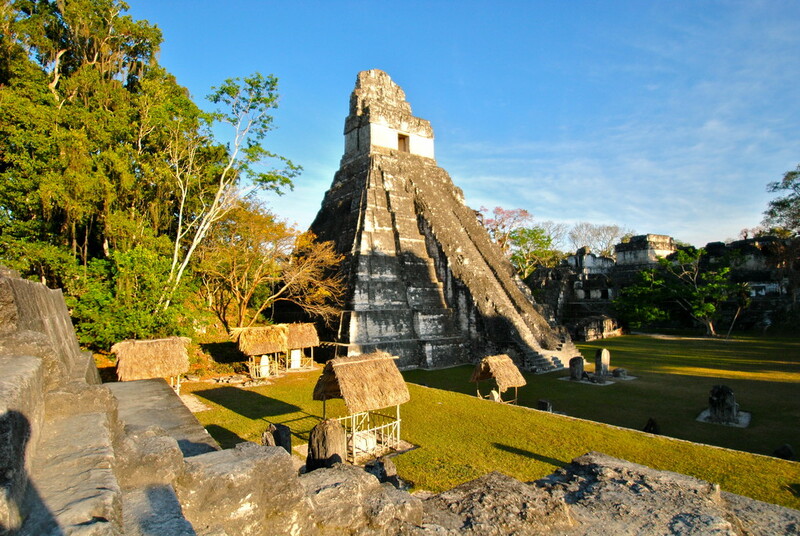 The Mayan Ruins Of Guatemala Our travels have taught us many things, what we both like and dislike, so when we arrived at the Tikal Guatemala ruins and found ourselves in a group of 20 people, we quickly made the decision to tour the park independently, and we would recommend you do too. A quick chat with our tour guide to arrange a meeting time, and we were off exploring the acres of ruins ourselves! It would turn out to be a wise decision. The first thing that struck us about the site is just how vast it is, covering over 16 square kilometres, with the majority of it completely untouched and unexplored. 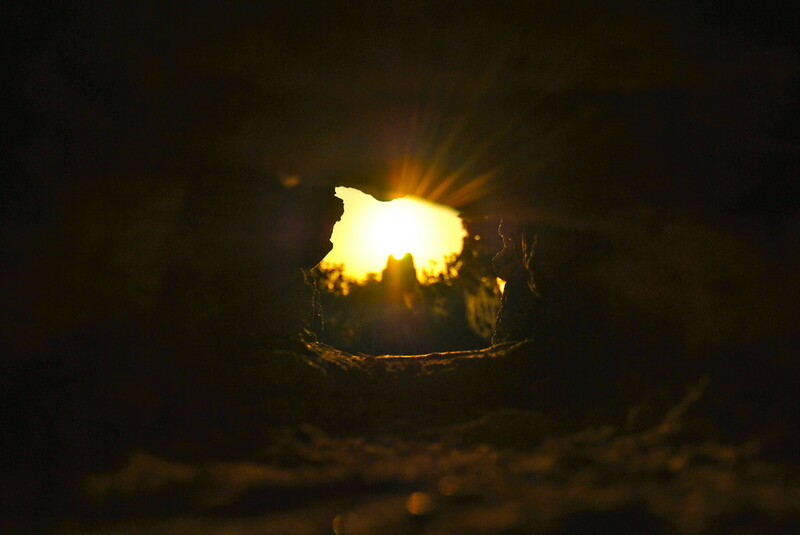 There are estimated 3000 structures hidden in the deep undergrowth just waiting to be discovered! 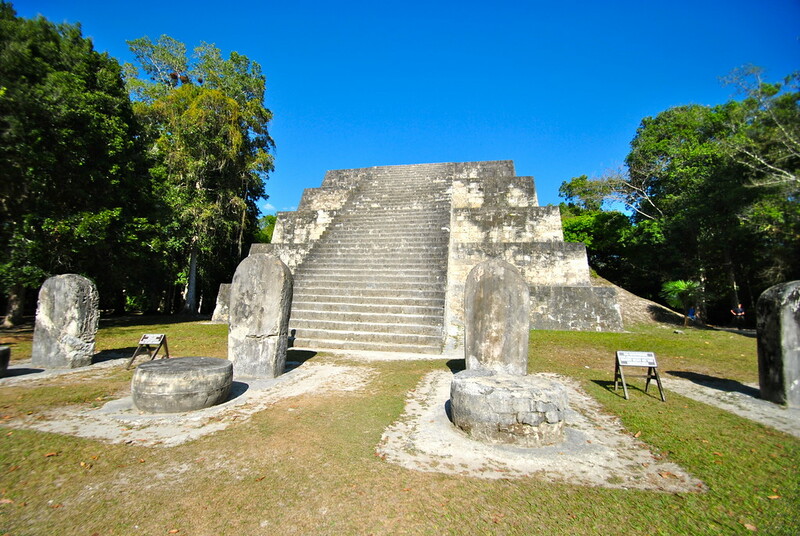 The first site we came across was a magnificently preserved square stone pyramid, its huge steps inviting you to climb to the top. Unaccustomed to such access to historic sites, we clambered up the huge stone steps, filling us with a mix of wonder and burning knee rage as we made our way to the top. 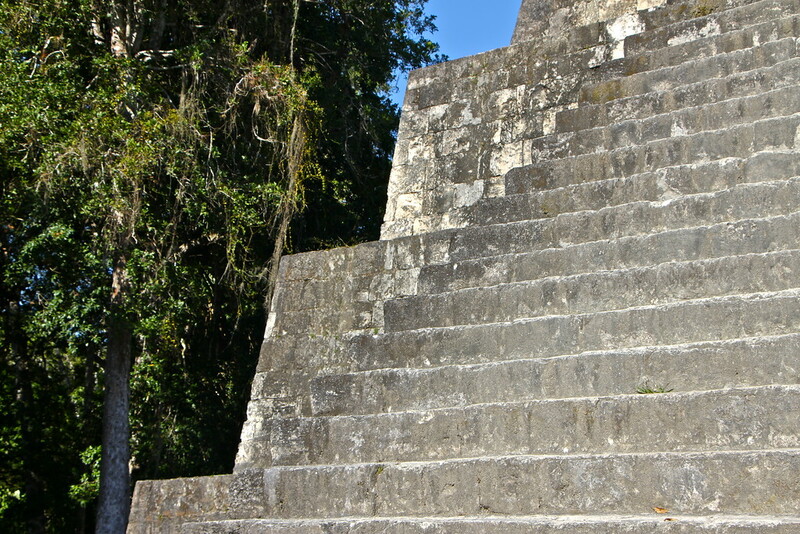 After this fantastic starter, we wanted to see the largest and tallest of the ruins at Tikal, and took off along a jungle path to get there. 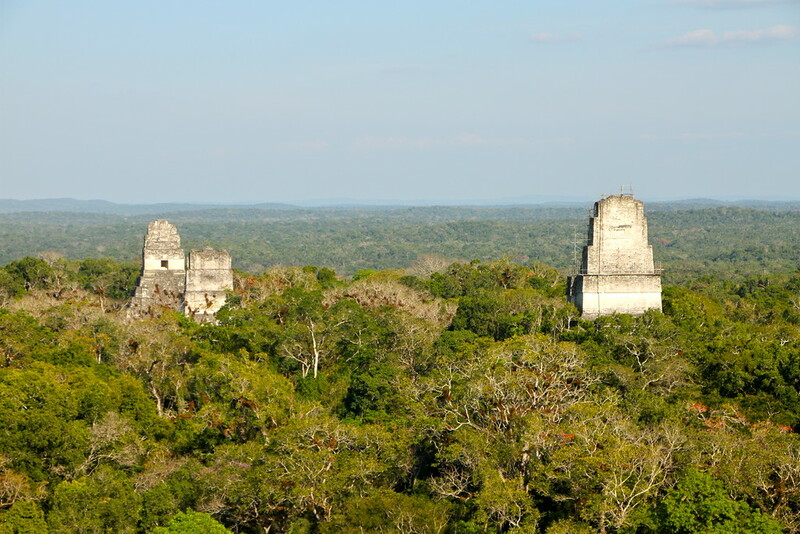 This is where the Tikal National Park comes into its own. After only a couple of minutes walking from the previous ruin, we were in the middle of the jungle, walking along a dry muddy path as it weaved through the various vines and trees. After 10 minutes of walking, and doubts creeping in as to whether we were going the right way, we stopped for a drink of water and rest, and heard a group of almighty howls go up from the canopy around us. Looking up, we counted what must have been at least 10 monkeys clambering through the canopy, jumping and swinging from branch to branch with ease. We sat in awe for a few minutes as they made their way passed our position and onwards into the jungle. Remembering we had come to see the ruins and not the wildlife, we carried on, but couldn’t believe our luck. Climbing up to the second of the ruins for the day, this was the one that gave us a sense of the scale of the Tikal national park, with other smaller temples puncturing through the green carpet below us. This was a fantastic spot, we sat and ate our sandwiches as we admired the view below us, imagining the family of monkeys we met previously somewhere in the vast jungle below us, swinging and howling as they went. 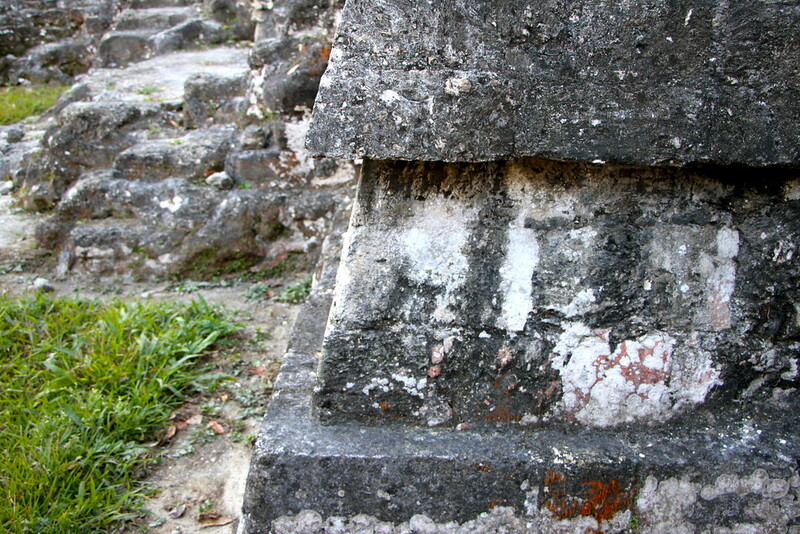 We moved on through the park, literally stumbling across new ruins without a soul in sight. It was quiet and serene, and we took our time admiring a temple full of bats, where my bravery went as far as sticking my head in as a bat leapt out of the darkness! Serves me right I guess, Laura kept a safe distance as you can see from below! Then it was onwards to the main event, the incredibly elegant Great Plaza, a green courtyard surrounded by beautiful stone pyramids and Acropolis. 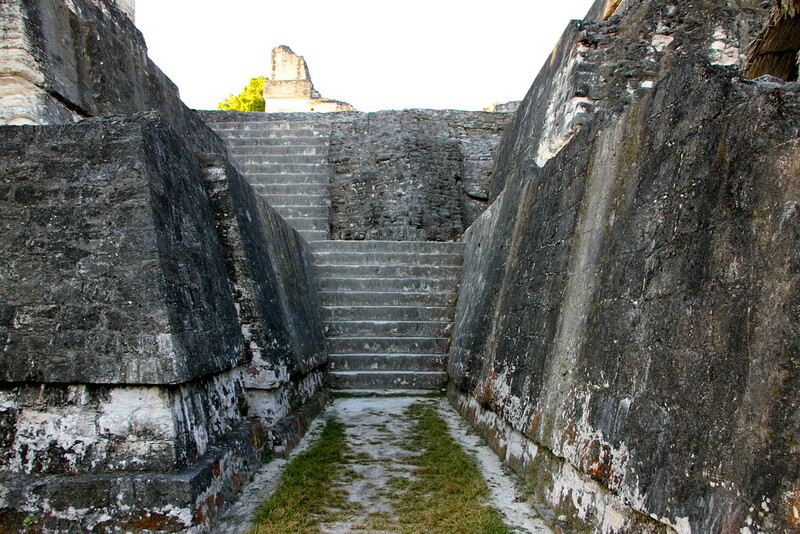 Rising 47 metres above us, two stone pyramids stood at either side of the courtyard, facing each other in an eternal stand off, their huge brick steps leading upwards away from us. 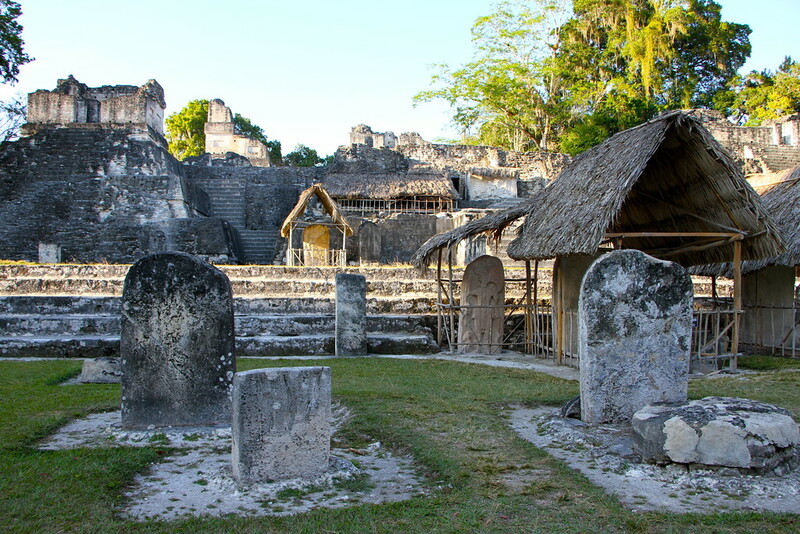 Flanked on either side of the plaza are the North and Central Acropolis, where we would eventually rest and watch the sunset. 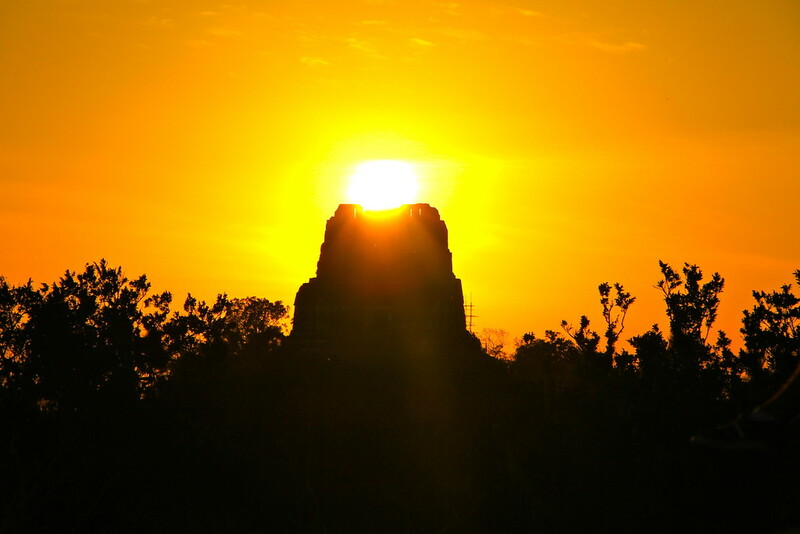 On a clear day, sunset is incredible here, and our time there was no exception, the sun dropping perfectly over a temple in the distance to cap off a fantastic day around the ruins of Tikal. 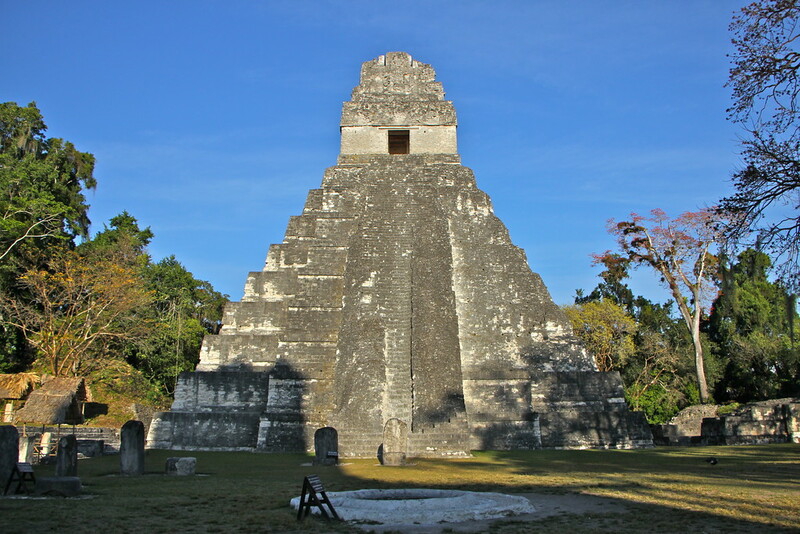 It goes without saying that no trip to Guatemala is complete without a visit to the Tikal ruins! For those keen to visit, you can use the nearby island of Flores as a base, with numerous operators offering day trips to the ruins. If you find yourself in a large group, grab a map and head off exploring on your own, you won’t regret it!